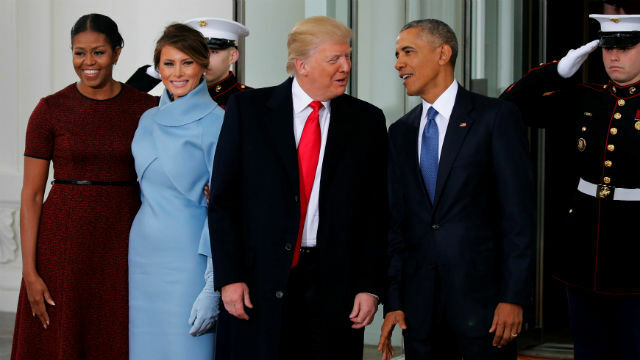 Donald Trump was sworn in as the 45th president of the United States on Friday, succeeding Barack Obama and telling a bitterly divided country he will pursue “America First” policies at home and abroad. Afterward, he stretched his arms wide and hugged his wife, Melania, and other members of his family. Then he turned around to a podium and delivered his inaugural address. “This moment is your moment, it belongs to you,” Trump told a large crowd that had earlier booed Chuck Schumer, the Democratic minority leader in the U.S. Senate. Revisiting themes from his improbable campaign victory, Trump said his presidency would aim to help struggling middle-class families, build up the U.S. military and strengthen U.S. borders. “We are transferring power from Washington D.C. and giving it back to you,” he said. He urged Americans to “debate our disagreements honestly, but always pursue solidarity” and understand that “there is no room for prejudice” in a patriotic nation. “It is time to remember that old wisdom our soldiers will never forget: that whether we are black or brown or white, we all bleed the same red blood of patriots,” Trump said. While frequently returning the campaign themes of trade and border security, he also challenged the country to strive for a better future. “We stand at the birth of a new millennium, ready to unlock the mysteries of space, to free the Earth from the miseries of disease, and to harness the energies, industries and technologies of tomorrow,” he said. Trump, 70, takes over a country divided after a savage election campaign. A wealthy New York businessman and former reality TV star, he will set the country on a new, uncertain path at home and abroad. In another location not far from the White House, protesters also scuffled with police, at one point throwing aluminum chairs at them at outdoor cafe. Hillary Clinton, the Democratic candidate who Trump defeated on Nov 8, attended the ceremony with her husband, former President Bill Clinton. Former presidents George W. Bush and Jimmy Carter were also present with their wives. Bush’s father, former President George H.W. Bush, 92, was in Houston recovering from pneumonia. Trump and his vice president, Mike Pence, began the day attending a prayer service at St. John’s Episcopal Church near the White House. Trump, wearing a dark suit and red tie, and Melania Trump, clad in a classic-styled, powder blue ensemble, then headed into the White House for a meeting with Obama and his wife, Michelle. Trump took office with work to do to bolster his image. An ABC News/Washington Post poll this week found only 40 percent of Americans viewed Trump favorably, the lowest rating for an incoming president since Democrat Carter in 1977, and the same percentage approved of how he has handled the transition.